When I saw a message on Facebook from Fiona Outdoors looking for one more runner for her relay team I couldn’t resist a trip out to West Scotland, renowned for its stunning beauty. I’d also never run in a relay before so thought this might be a fun option for something different. Having never met my team mates before, Fiona and Nick, I was assured we were not going to compete we were purely there for fun*. 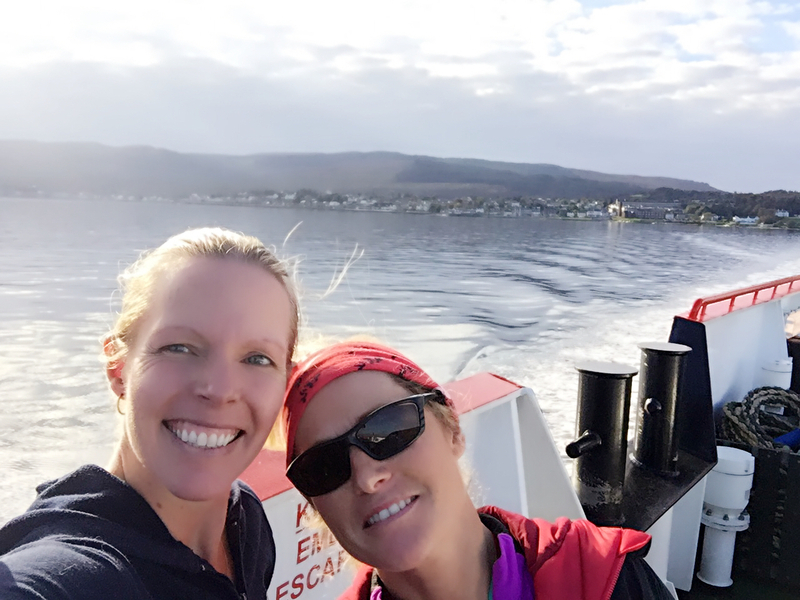 Getting to Dunoon already feels like an adventure as after heading out from Glasgow you reach McInroy’s Point at Gourock and board the ferry to cross over the Firth of Clyde. We were blessed with a stunning day so this made the crossing all the more magical. 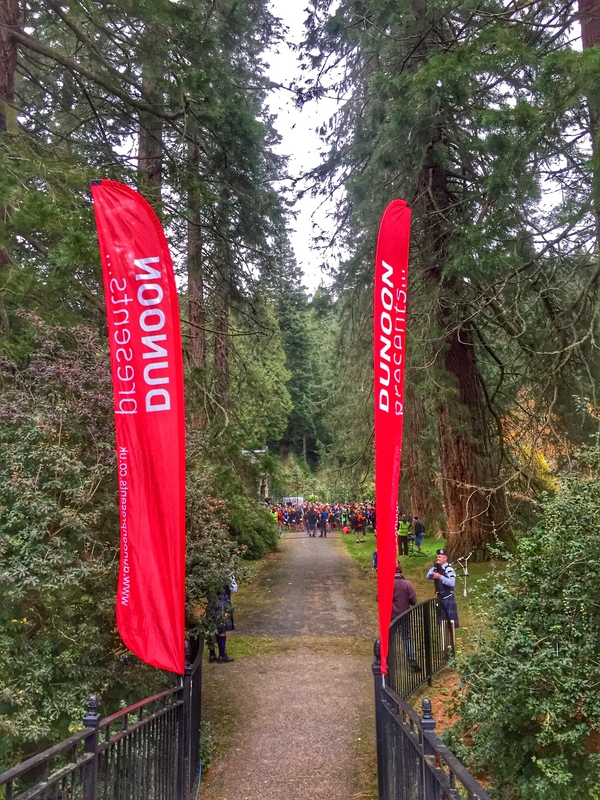 The race starts from the Benmore Botanical Gardens in amongst the magnificent giant redwood trees, which can be reached by a 15min drive from the ferry stop, though a coach transfer is provided as part of the event. 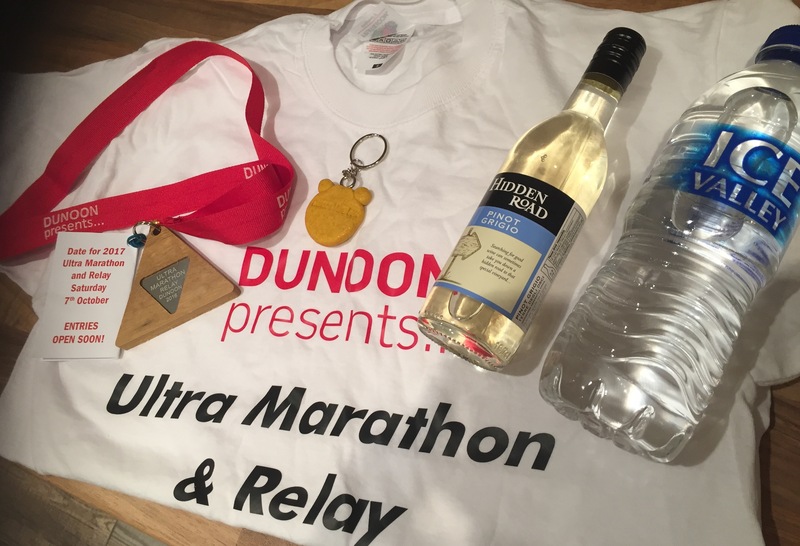 The race starts at a very civilised time of 10am and is now being dubbed as the most scenic ultra in Scotland. The race kicked off to the sounds of bagpipes and canons, no countdown or fog horn to start proceedings here. Nick Green was our first runner, an experienced triathlete who took the first leg, which he said was no doubt the toughest leg of the race where the runners headed north climbing high above Loch Eck to reach the highest point of 335m before a 2 mile descent brought him to transition 1 where Fiona took the batton with us in 5th place overall for the relay. Fiona took off like a shot along the flattest part of the route following the loch shore closely heading back to the Botanical Gardens for transition 2. Flying into T2 she flung the batton to me after pushing us into 3rd place overall. “No pressure Lucja, but run!! 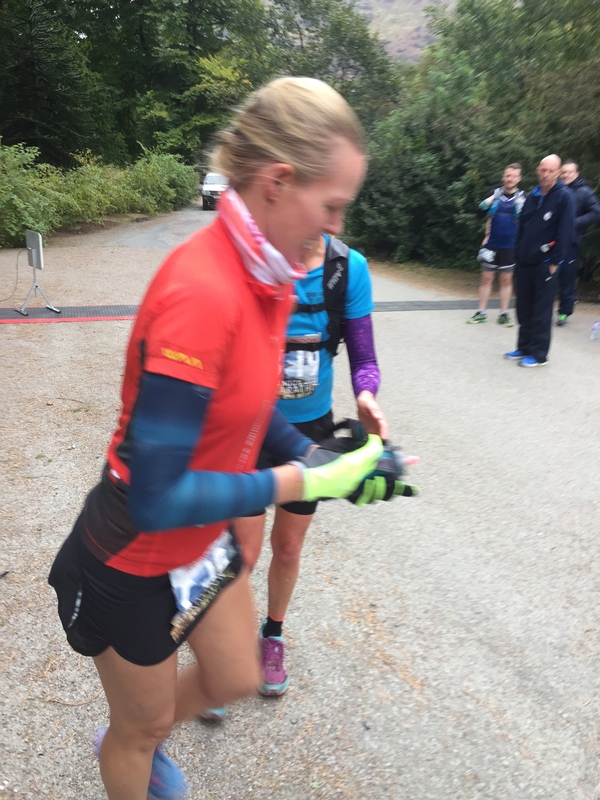 !” I didn’t even have time to put her Suunto watch on which she was using to track the entire route and just shoved this into my pocket (this is where the WAA carrier shirt I’d pinched from hubby, Dion’s, drawer came into good use), not time to waste, I had a position to uphold. After a short flat section the 3rd legs ascends on forest trails towards Dunoon, the views were absolutely stunning from the top of the woodlands of Bishop’s Glen where I could see the finish of the restored Dunoon Pier for at least 5 miles before I go there! 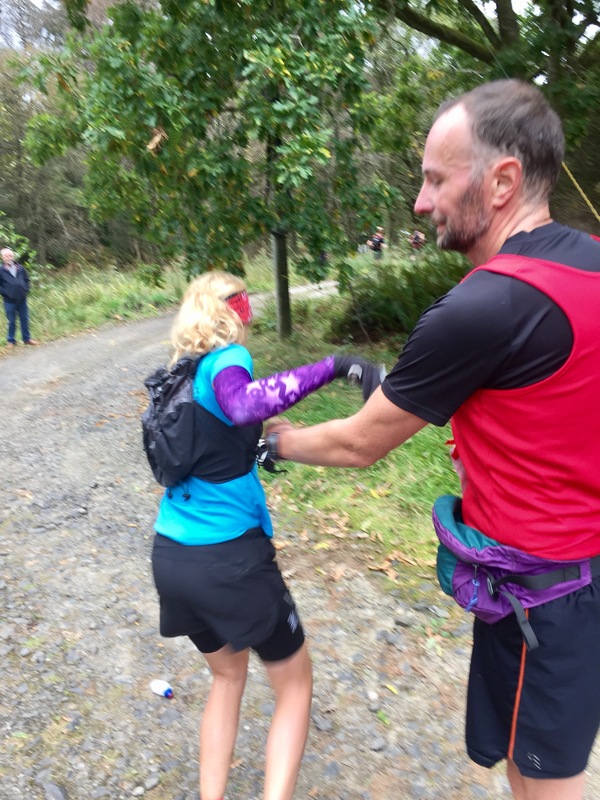 I didn’t have time to stop for any runfie’s though, I had just rounded up another relay runner putting us in 2nd overall so had to hot foot it for the final descent into Dunoon. It felt good to run with a bit of pressure like that where I wasn’t just running for myself but I had a ‘team’ to worry about. Running is normally such an independent sport that I found the relay team element quite encouraging and exciting, so much so I would consider doing this again. 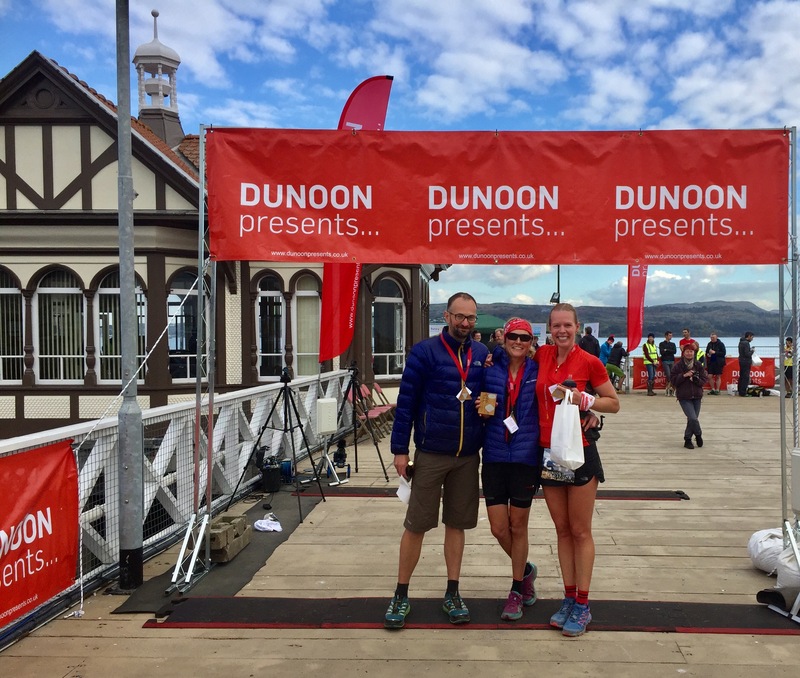 I was greeted by cheers and hugs as I came across the finish at Dunoon Pier, we were 2nd relay team overall but 1st mixed team! What a result! Considering we were here only to have fun, we did very well. The finish line was a bustle of fun and activity with plenty of hot food (free for the runners) and cakes to restore the energy levels along with a massage. The race entry is £33, with an early bird discount at £23 for the first 100 entrants which includes tea & coffee with fresh pastries at registration, coach transfer, changing facilities and the full event support with electronic chip timing, check points, drop bags with food & water stations, first aid back up and of course a fabulous goody bag.